Skunk rolling papers with accacia gum are made in the country of Spain from pure hemp. 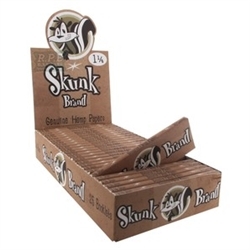 Skunk 1 1/4 rolling papers have a lot of loyal customers who love the iconic Skunk character "Skunky" as well as the nice and slow burning rolling papers. Skunk rolling papers in 1 1/4 Size measure 4.25" x 1.75". Each booklet has 50 rolling papers and the box has 25 booklets.